Rev. 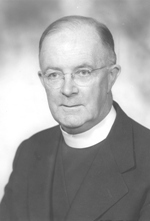 Richard J. French, CSV, who led the Chicago Province of the Clerics of St. Viator, from 1939-1949, died June 2, 1973 at St. Francis Hospital in Evanston, IL. He was 83. Fr. French was born in Oxton, England and completed his early studies in English and Canadian schools. An Episcopalian by birth, he converted to Catholicism at the age of 16. After coming to this country, he attended St. Viator College in Bourbonnais and Columbus Seminary in Chamberlain, SD. Fr. French was a Viatorian for 64 years and a priest for 52. He was ordained on May 21, 1921 in Chicago’s Holy Name Cathedral by George Cardinal Mundelein. After his ordination, Fr. 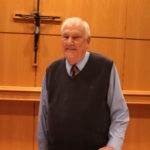 French continued his studies, earning a master’s degree at Catholic University in Washington DC and a doctorate degree in education from Loyola University in Chicago in 1931. Fr. French then served as a professor of education at Columbus College and at St. Viator College, where he also served as vice-president for two years, as well as dean of studies and director of scholastics. Among his various other duties, he was administrator of St. Louis of France Church in Chicago, from 1930-31. In 1950, after 10 years as provincial, Fr. French was assigned as assistant pastor at St. Anne Church in Dixon and later at St. Peter Church in Geneva, until his retirement in 1966. In 1971, he celebrated his golden jubilee as a priest. A funeral Mass was concelebrated on June 5th at St. Viator Church in Chicago. Included in the delegation was Auxiliary Bishop Michael R. Dempsey, representing Cardinal John Cody, who gave the final commendation. He was laid to rest in Queen of Heaven Cemetery in Hillside.